Glanbia has said that its closure of the Belview plant this week was scheduled and is not a problem – rather, the market is the problem. A spokesperson for Glanbia said that the closure this week of the Belview plant was scheduled and was due to seasonally low powder production. They also confirmed that the 76 direct jobs at the plant were not at risk. The spokesperson also said that to date the Glanbia plant has processed 311m litres and has manufactured 36,500m tonnes of product to date this year. Glanbia listed the closure of Belview as one of its principal risks and uncertainties in its annual report. The report states that a plant shutdown at any of the Group’s factories due to an unforseen incident, especially over the peak milk supply, was a serious risk. The report also lists the Group’s effectiveness at ensuring that the market returns from the sale of products are reflected correctly in the milk price paid to dairy suppliers as a key concern. However, Glanbia has been heavily criticised in recent weeks over the milk price it is paying suppliers. It was the only processor to cut its September milk price. Both the IFA and the ICMSA met with Glanbia this week to address the issues. According to the ICMSA, farmer-suppliers present at the meeting expressed the sentiment that Glanbia Ingredients Ireland Ltd (GIIL) was now paying a milk price absolutely at odds with the commitments made at the time of its establishment and which had played no small part in persuading farmers to support the group’s re-organisation. “At the time of its establishment GIIL made a categorical commitment to paying a competitive milk price – it couldn’t have been any clearer – and the feeling of their suppliers as expressed at the meeting was that the current milk price gap that GIIL have allowed to open up between their price and the price being paid by other processors is absolutely at variance with that commitment. “GIIL should be paying a milk price in line with market returns – something the ICMSA county officers feel they are clearly not doing this at this time,” said an ICMSA spokesperson. Belview cost Glanbia €185m and was officially opened in 2014. It has two 7.5t dryers for the 700mL of milk it is to process annually and is responsible for 1,600 direct and indirect jobs. Glanbia says the facility will allow for the manufacture of specialised milk powder products and nutritional ingredients to meet the demands of multi-nationals in infant formula and other industries operating in Asia, the Middle East, Africa and Central America. The Glanbia Belview processing facility was officially opened in March 2015, but the first milk went through the Belview plant in mid December 2014 as part of a ‘dry run’. Construction started on the project in May 17, 2013. By 2020, Glanbia’s 4,800 milk suppliers expect to increase milk production by 63%. 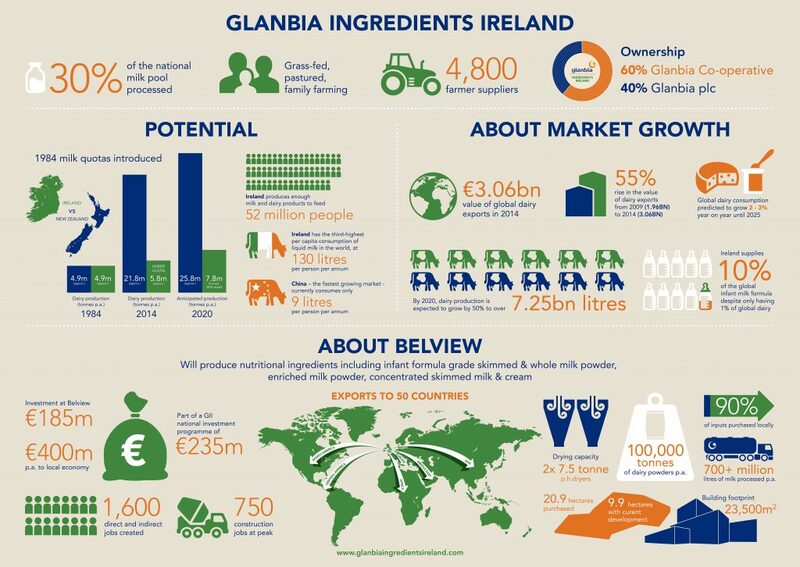 Currently, Glanbia Ingredients Ireland processes 1.8 billion litres of milk or 30% of Ireland’s milk pool into a range of dairy ingredients for export to more than 50 countries. Milk processing capacity – 2.5m litres of milk a day. Each of the two dryers will process milk from 60,000 cows a day. Six raw milk silos have the capacity of 300,000L. The dryers can work for 28 days straight. Belview has 24,000sq/m of floor space – almost the size of two hurling pitches. There is 36km of pipes in the plant. It is equipped with 1,700 sensors monitoring milk movement. Belview is being driven by 500 motors. It will produce 100,000 tonnes of dairy powders per year. It will provide direct employment to 76 people. It will also provide indirect employment to 1,600.